It can be difficult to remove ink from any kind of paper. 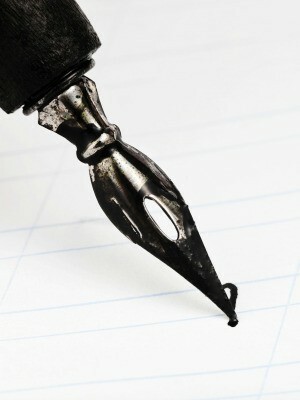 This is a guide about removing pen ink from paper. Can you remove Biro pen from the cover of an art sketchbook? Please answer soon as possible. Thanks. Sometimes you can use an eraser to get rid of the stain. YOu could also use some sandpaper or a nail file to abraid the surface of the cover so that the parts that got stained are filed away. This will create a rougher patch but it should take care o the stain. You do run a risk of tearing the cover, though. An artgum eraser, or Mr. Clean Magic eraser should work. I have this journal which has very thin papers and I did a mistake while writing the sentence. So how do I remove the ink? I used a ball point pen. I don't want the page to get dirty since it's a school assignment. This is going to be a huge challenge and probably near impossible to make it disappear without affecting your thin paper. Try dabbing diluted acetone very very gently with a cotton ball. I used this method on thick card stock before. It lifted the ink but you could tell something had "happened"
White out to cover it? That is unfortunate - thin paper too. I have used different methods and been successful (but not as if it was never there) as different types of paper will require different methods. I have a couple of links that give several methods so read everything (all suggestions from others) before you begin and do everything slowly.. Try to find a piece (last page corner maybe?) that you can experiment on before touching your real paper. Good luck - hope something works. I do a lot of black and white drawing with ink. They do sell a bottle of ink cleaner for the drawing pens. I remember buying it at the art supply store when I was in the US. I would start with this. But, before trying anything on this paper, you need to do a test first. Get another piece of paper the same as in your book. Mark it with the same pen. Now take the ink cleanser and put a small bit on a cotton ball. Dab it on the paper. Do not rub it in. Let it dry and dry again. See if this will remove the ink and not make the ink run on the paper. I have used this technique on several drawings I did when I ended up with a blob of ink after refilling a pen. The only other way of doing this is with White Out. I would not use the liquid one or the one that comes in a pen. I would buy the one that comes with a tape like dispenser and use it. Again, before doing anything in your journal, test it on your scrap piece of paper. I was unfortunate to have a vintage brochure ruined by blue pen ink marks and I am wondering how to remove them without damaging the brochure? Your help and advice would be greatly appreciated. Have you tried pure acetone? It's often found in art/office supply stores (to thin rubber cement, renew markers, etc.) or sold as nail polish removers (read the label to make sure it's pute 100% acetone). Be careful, since it may ruin the brochure, depending on the type of ink originally used to print it.